Video lighting can add so much to your videos. Lighting can help you tell a better story – making your video more dramatic, more romantic, more corporate. In the video above, Will Carnahan of Will Call Cinematic shows how simple lighting setups can change the mood of your video. We’ll run through a few set ups with just 3-4 lights. Typically, a scene brightly lit with lights will give a more cheerful positive feeling than a darker scene. Take out those lights, add lots of shadows, and your scene may give a more menacing and threatening vibe. In terms of corporate videos, making sure your subject is lit well is very important. Without lights, a dark video can look amateurish. Typically, the brighter part of your image is where the viewer’s eye is drawn. One rule of thumb is to make the most important thing in your shot brighter. This could be a person or an object. Light can range in color temperature – from warm to cool. Using warmer tungsten lights in a scene can be more romantic than cooler fluorescent ones. The warm flicker of a fireplace can also add to the romantic mood. At the same time, the warm flicker of fire could mean something more foreboding. Similar to how bright or dark your scene is, harsher/contrasty light can be great for horror films. While softer more diffused light can be better for romantic comedies. Learn how to set up lights properly to show off these moods in the video lighting tutorial above. You may also want to watch our 5 Tips for Better Cinematography Video. 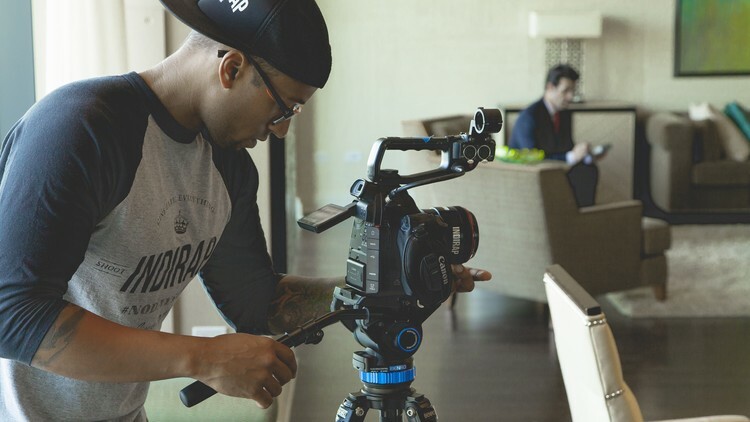 Our Creative Cinematography Course will teach you how to shoot better video with any camera with settings, composition, lighting, and pro camera movement.